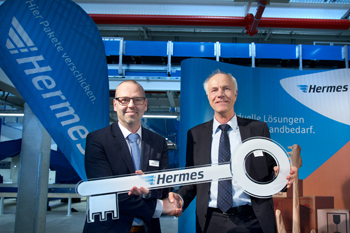 Hermes Germany's most southern logistics center officially commenced operations 15th February in the Bavarian town of Graben. Over 100 guests celebrated the opening of the fourth, of a total of nine, new logistics centers to be opened as part of Hermes' major infrastructure program by 2020. 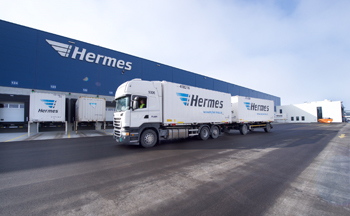 Designed and built by ECE Projektmanagement from Hamburg, Hermes Germany's most southern logistics center (LC) officially commenced operations today in the Bavarian town of Graben. Over 100 guests celebrated the opening of the fourth, of a total of nine, new logistics centers to be opened as part of Hermes' major infrastructure program by 2020. Some 300 million euros ($370m) has been set aside for the program. The LC in Graben was built for 40 million euros ($50m), creates 120 jobs and will process more than 100,000 parcels daily. Together will the LC in Bad Rappenau in the neighboring state of Baden-Würrtemburg which was opened in May last year, the state-of-the-art site in Graben will provide the best possible logistics coverage for customers across southern Germany. "Our new LC in Graben is a key hub for a large part of Bavaria and eastern Baden-Württemberg", boasts Markus Hobein, General Area Manager Munich at Hermes Germany. "Given the continuous nationwide increase in volumes, the construction of a high-tech distribution center in the south of the county was essential and will enable us to provide a better service for our clients by speeding up transshipment and offering shorter delivery times." Dirk Rahn, COO at Hermes Germany, argues that the new logistics centers will provide the foundation for greater competitiveness in the future: "In total, we will be building nine new high-tech distribution centers by 2020. These new sites will help bolster our position as one of the leading parcel delivery companies in Germany, enabling us to reliably handle the sustained growth in e-commerce volumes." In his welcoming speech, local politician Martin Sailer underscored the benefits for the region: "We are one of the most attractive logistics locations in Germany and I am delighted that Hermes has built this incredible logistics center in Graben. Direct accessibility to the traffic network, our persuasive business development program and the straightforward nature of our urban planning procedure all provide successful national and international corporations with the best possible conditions for locating to the region." The large hall covers 8,700 square meters – or one-and-a-half football fields – and will be capable of processing more than 100,000 parcels on a daily basis. The whole site is an exhibition of high-tech. 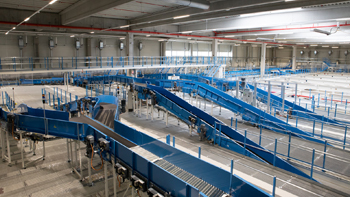 The Siemens belt tray sorter, for example, runs at 2.5 meters (8 feet) a second, moving up to 13,000 parcels each hour and Corlette container tilt stations and bulky item sorters provide for the best possible handling of parcels. Such a huge surface area and a total of 100 bays for loading and unloading requires intelligent management. The new distribution centers deploy state-of-the-art IT systems that control yard management in real time, guaranteeing seamless processing. On top of this, the calibrated measurement of parcel volume and weight enables transport capacities to be detailed with accuracy which itself ensures that the Hermes fleet is not only effective, but also ecologically optimized. As with all other Hermes logistics centers, the new LC in Graben has been awarded gold status by the German Sustainable Building Council (DGNB). This certificate recognizes the exemplary management of resources and environment. Alongside ergonomic and barrier-free workplaces (including height-adjustable desks), the Graben site is surrounded by extensive green spaces that have been laid out in collaboration with the German Nature and Biodiversity Conservation Union (NABU). From initial planning through to the hand-over of the keys, the construction of the Graben logistics center was in the hands of Hamburg-based ECE. "After Bad Rappenau, Mainz ad Berlin, we are now pleased to hand-over the fourth logistics center in series. This is a further step along the path to successfully implementing this joint large-scale project of building nine logistics centers across Germany, which we are building in close collaboration with Hermes Germany," says Dr Andreas Mattner, managing director at ECE with responsibility for Office, Traffic and Industries. ECE handled the whole project – from the site search, the purchase of the land and the planning through to the turnkey construction and placing the object on the investor market. ECE sold the Graben center together with completed centers in Bad Rappenau, Mainz and Berlin, and projects planned for Hamburg and Halle to Frasers Property Investments Europe. The logistics properties are based on a sophisticated prototype developed by ECE and available in two sizes. This not only saves time building the respective sites, it also makes it highly cost-effective.